← Eurokracy. What is it? I was going to write about my cross-country trip and its wonderful scenery, but it turned into quite an ordeal. So, I will focus on the adventure itself. The plan was to travel from West Vancouver, British Columbia to Lachute, Quebec; a 4,500km trip. I have been driving for over 40 years and I’ve never had an Automobile Association membership. I did have friends and acquaintances that swore by CAA. Since my wife and my cat were going to accompany me, I thought it would be good insurance, as it were, to get a CAA membership. In Canada, the membership is provincial. A few days before the trip, I took the full package which included RV coverage. 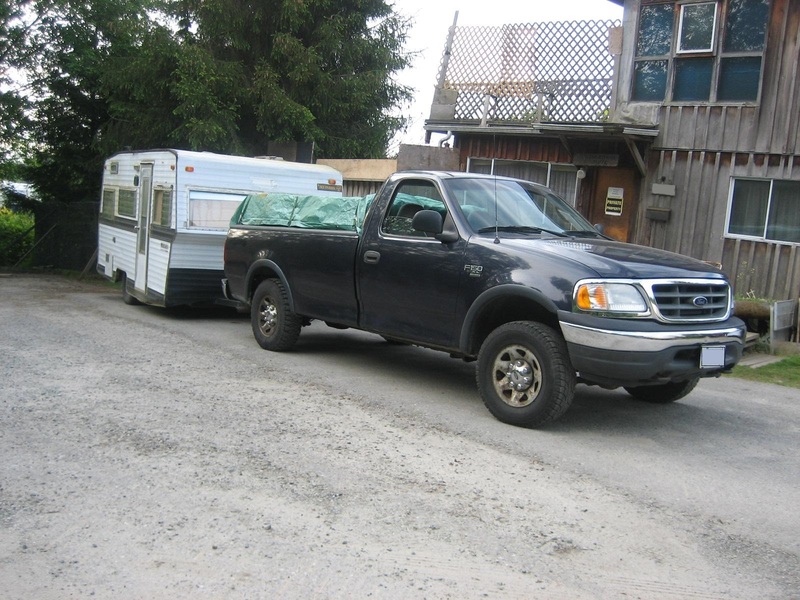 The Rig: a 1997 Ford F150 and a 1969 14’ travel trailer, with all lights running. To be on the safe side, I visited my neighbourhood auto wrecker and purchased an as-new set of tires for the back wheels. The ones I had on were getting a bit bald. I also had the wheel bearings repacked on the trailer and my mechanic gave me an extra set of bearings just in case. We began the trip on a beautiful Sunday morning. the second week of May. Vacation hadn’t started for most people, since kids were still in school, so we assumed that traffic would be light for the duration of the trip. The temperature was in the mid-teens; perfect weather for driving. 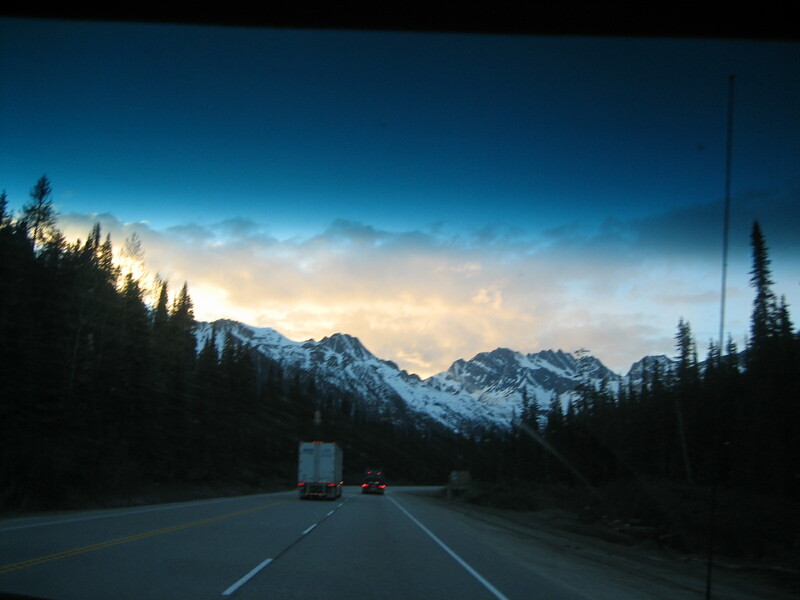 We made it through Vancouver and meandered our way up the Rockies. Every time we stopped for gas, we checked the rig and made sure that everything was holding up. We stopped in Sicamous, BC to top up the gas and have a bite to eat. We had traveled about 500km and all was going well. 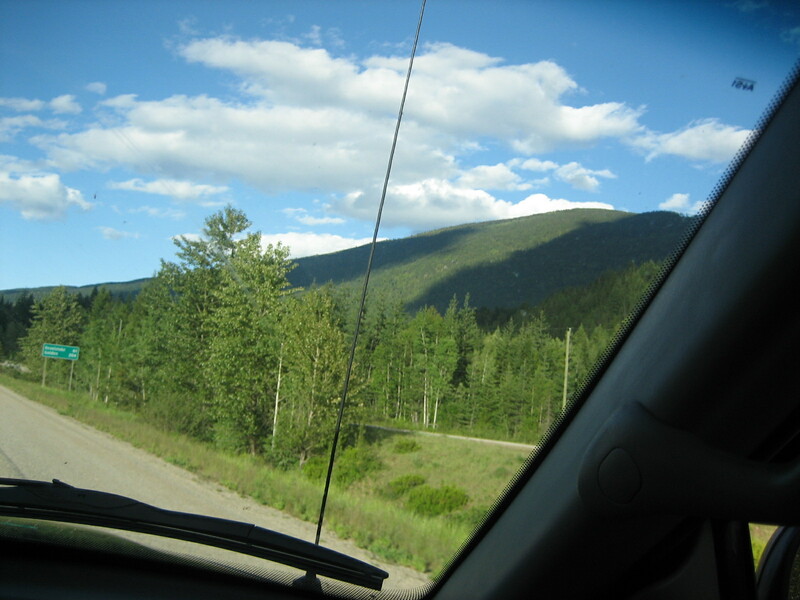 About 12km outside of Sicamous, we hear a big bang and I see a trail of dust coming off the back of the truck. We were on a straight and flat surface with a large paved shoulder. It made it easy to pull over as quickly as I could. Making sure it was safe to get out of the truck as the highway traffic zipped by; I walked to the rear passenger side to discover that one of my “new” tires had blown. Fortunately, the inner tube was still intact and held the tire at the same level as the others. The steel belt had exploded outwards and left a big gaping hole. Annoyed to say the least, I pulled out my cell phone hoping to get a signal. We must have been close enough to a tower and I was able to dial BCAA. I didn’t even have my membership card which had not arrived in the mail yet, but I had printed the necessary information. The customer service person was very helpful and assured me that someone would be there within 45 minutes. As advertised, a young man showed up in a car. He mentioned that his tow truck wouldn’t start, but he did have all the necessary tools to change the tire. I had a spare underneath the bed of the truck. 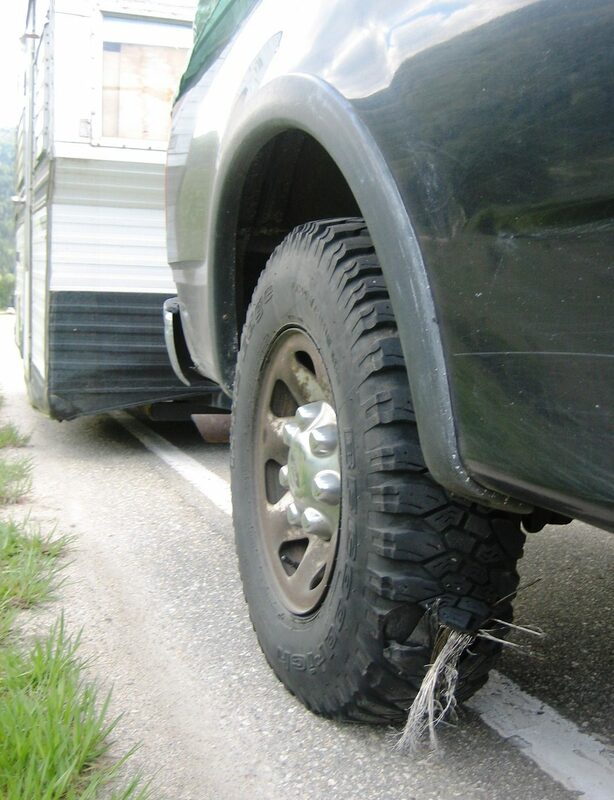 After unhooking the trailer, he put the spare on and the busted tire under the truck. The spare was low, so he advised that we should turn around and inflate it in Sicamous, which we did. The young man was very helpful and he had to rush. He got a call from BCAA for another flat tire. That delayed us for a couple of hours, but we were still determined to make it to Canmore, Alberta before night fall. That was another 5 hours’ driving. It was a bit too ambitious. I didn’t want to push the tires too much because the spare didn’t match my other “new” tire, and I was afraid that it too could explode. So, we stopped in Lake Louise by the side of the Trans Canada highway. Of course, we hadn’t checked the weather and it was snowing. Warmer clothes were packed in the trailer. We couldn’t find the winter clothes. We had gutted the trailer and packed it with boxes and household items. Some boxes had shifted, but Java Man, the cat, was okay. My wife stayed in the cab. We tried to sleep, However, the cold and the noise from the traffic was such that we couldn’t catch a wink. So, after a couple of hours, trying to rest, I decided to push ahead to reach Canmore past Banff. It was still dark. The advantage of traveling at night is that there is little traffic except for the big rigs. With little traffic, there was less chance of holding up people as we made our way through Rogers’ Pass and Golden, BC. It’s slow going when you pull an overloaded trailer on bad tires. It was around 5am when we finally reached Canmore. It was still snowing and we were still freezing. We found the Canadian Tire and waited for it to open. I unhooked the trailer in the parking lot and put a couple of shopping carts in front of it so nobody would park there before I returned with the truck. I wanted to replace both rear tires and have the spare put back where it belonged. 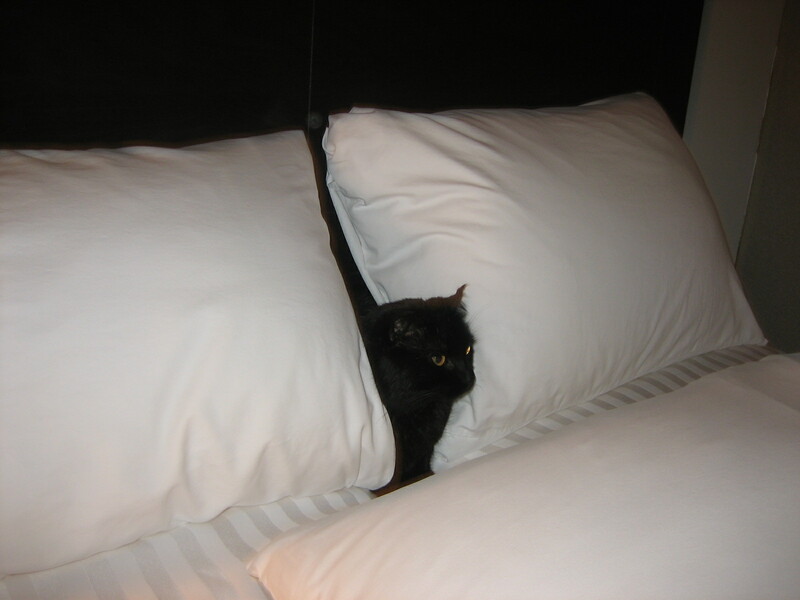 Of course, they were booked up, but they were very accommodating. They had the tires I needed and were done installing them before lunch. In the mean time, my wife did try to get some sleep, but it was the day that the landscape people showed up, weed eaters blazing to cut the grass, even though it was still snowing and there wasn’t any grass to cut. But they must have had a contract and did their work whether it needed it or not. After paying nearly $400 for the tires and work, I returned to the trailer and hooked it up. I noticed that the tires were very low under the weight of the truck and trailer. They had not inflated them properly, although I did tell them how much pressure it required. So, I went back to the Canadian Tire auto department. They didn’t have a mobile compressor and I had to unhook the truck again to bring it in. I specifically asked them to check the pressure in the front tires as well, but in the end, they didn’t do it. The problem with Canadian Tire mechanics is that they are paid when there is work. They are not on an hourly basis, which is beyond me. At least the mechanic inflated the rear tires correctly. The first time I hooked up the trailer, it took about two minutes. The second time, I was frustrated and tired, it took an eternity. 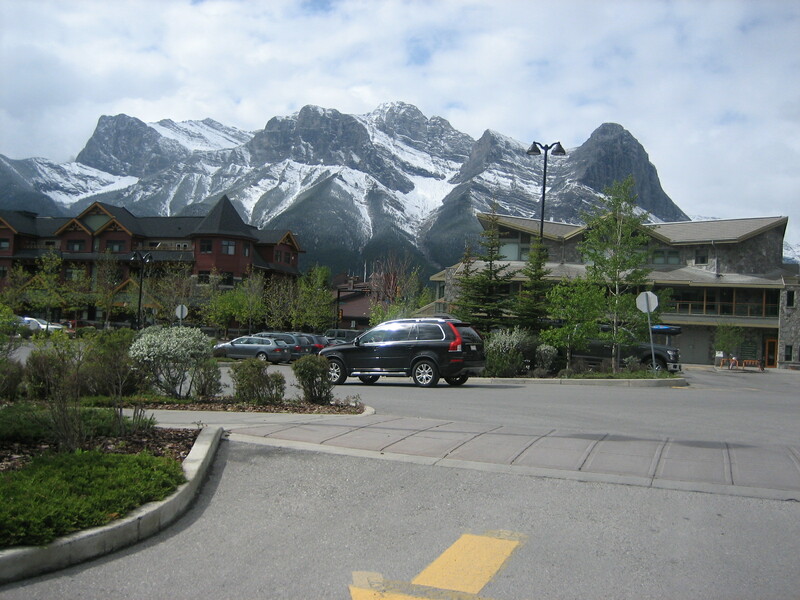 But off we went, leaving Canmore behind. As we neared Calgary, a thunderstorm erupted and the wind picked up. Not good when you are towing a trailer. The wind was sideways and started ripping up the tarp covering the goods in the back of the truck. I would pull at a stop once in a while to tighten the crappy tie-down straps over the crappy tarps I had purchased at CT before the trip. It did nothing. At some point, I tightened the strap so much that the cheap alloy mechanism broke. We kept pushing ahead. We made it across Calgary, stopping along the way to Medicine Hat and into Saskatchewan. The weather was getting worse. The wind was raging at around 90kph, still sideways at that. We stopped in Maple Creek for the night. We had wasted over half a day and it was getting dark. If I remember correctly, there was an official rest stop, but the visitor centre was closed. We didn’t care. We wanted to rest, but we kept on freezing instead. I finally drifted to sleep only to wake up soon after because some moron parked perpendicular to my truck and left his headlights on with his engine running. There was another car traveling with him and it too had its engine running. This time I was in the cab and my wife was in the trailer trying to keep her and the “boy” warm. of the truck. She wasn’t sleeping because of the cold. I asked her if she could get back in the truck, so we could keep on driving. We got back on the highway. The wind and snow were still raging. I pulled into a side road to tighten the tie downs and ropes and bungee cords for the umpteen time. Nothing doing. Curiously, there was a parked car with Ontario license plates. It looked like it had been abandoned there for a while. We stopped in Swift Current for gas and purchased a few more bungee cords. They were useless as the wind was too strong. 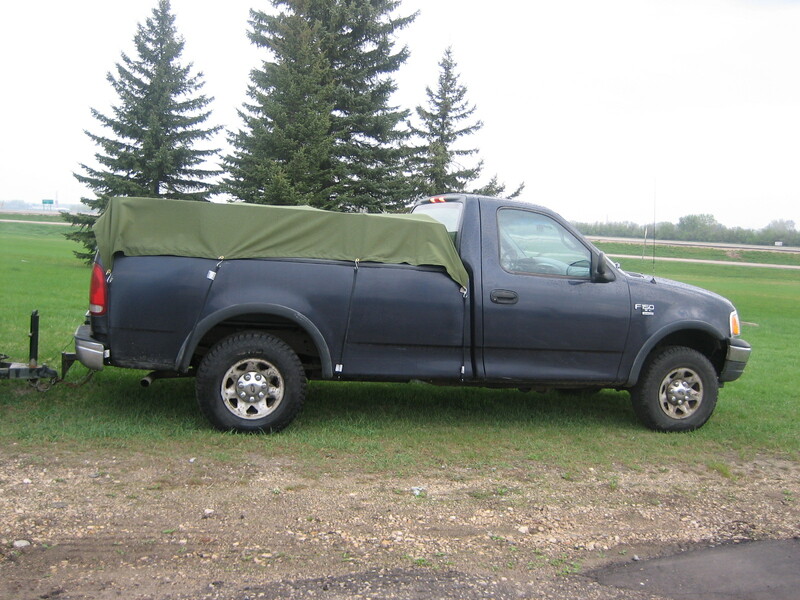 When we reached Moose Jaw, SK I saw a Canadian Tire sign and decided to stop to purchase a good tarp to put over the crappy ones that had been shredded by now. I bought a few more bungee cords for good measure. In the pouring rain, I set about to install the tarp and to tie it up. This time it held and would hold for the rest of the trip. I was soaking wet. 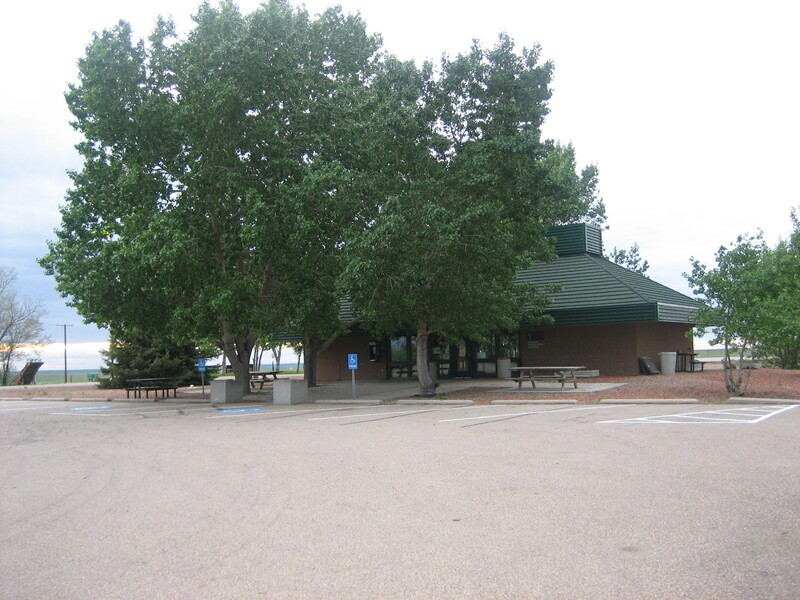 We made it past Regina and stopped in Indian Head at a gas station and diner. The road was bad. Tired and still wet, we made it to Brandon, Manitoba where we stopped at the Days Inn for the night. There was no way we could spend another night in the truck or trailer. I sneaked in Java Man. He wasn’t happy one bit with the travel arrangements. At least we all warmed up and had some rest. It turns out that they allowed pets. The next morning, the sun showed its face and we were on our way to Ontario. Before we made it to the border, we had to get past Winnipeg. We wanted to circumvent the city at any cost and took the by-pass. Besides construction work going on, the road was in very bad condition and the load in the trailer shifted quite a bit. Little did we know that it was a sign of things to come? 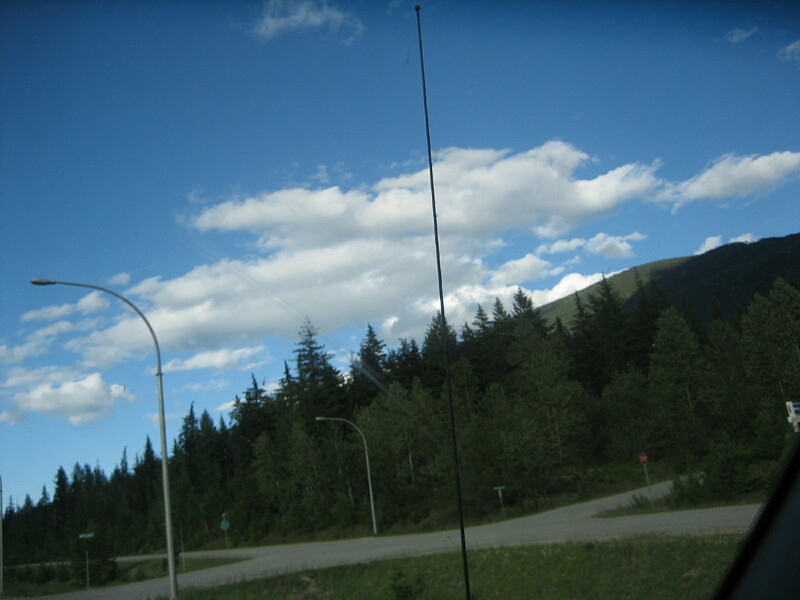 This entry was posted in The Driver's Edge and tagged alberta, automobile association, british columbia, calgary, canada, canadian tire, canmore, lake louise, maple creek, moose jaw, ontario, road trip, sicamous, swift current, vancouver. Bookmark the permalink.